Built using Valve’s Source Engine game technology (the same behind Half-Life 2), Vampire The Masquerade: Bloodlines is based on White Wolf’s pen-and-paper role playing game series, and developed by now defunct Troika Games. The game places players in the dark and gritty vampire underworld of modern day L.A. as a creature of the night, interacting with and battling mortals and other creatures of darkness with an incredible array of vampire powers, skills and traits. 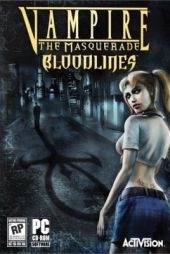 With atmospheric sounds and music, more than 7 different vampiric clans to choose from and an attractive, dark and gothic look, Vampire The Masquerade: Bloodlines is a fairly fun adventure, but most definitely for the Mature gamer… as grabbing passerby’s and sucking their blood for energy doesn’t usually make it an ‘E’ rated game. Our own gothic, cos-play wizard Ivan Baird put on his black velvet cape and inserted his fake vampire teeth to take a quick look at Vampire The Masquerade: Bloodlines from Activision.